Other researchers involved in this project are Prof. Jane Mariara (Director, School of Economics, University of Nairobi, and EfD Kenya Coordinator), Mbutu Mwaura (Monitoring and Evaluation Manager at Nairobi City Water and Sewerage Company (NCWSC)), Dr. Moses Ikiara (Managing Director, KenInvest) and Prof. Dale Whittington (University of North Carolina). Prof. Joe Cook (University of Washington) presented the preliminary data for the Water Sourcing in Rural Kenya project. Other members of that research team are Prof. Peter Kimuyu (University of Nairobi, and Chair of EfD-K Executive Committee) and Prof. Dale Whittington (University of North Carolina). Prof. Dale Whittington also gave an illuminating presentation on ‘Global Context in Water Policy’ at the event. EfD Kenya’s main objectives were to bring together stakeholders and researchers in water policy in Nairobi specifically. 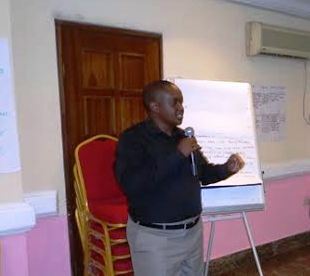 In particular, EfD Kenya wanted to bring together the water service providers, the regulators and government water organizations as well as civil society and academics in order to increase the diversity of feedback on the two projects that were presented. EfD Kenya is also keen to develop long-lasting relationships with the aforementioned organizations in order to further optimize research efforts. “We have drawn a lot of lessons from this and past policy days. In subsequent policy days, we intend not only to share our findings with stakeholders but also request them to share with us policy issues they need researched. It would also be important to invite the media in future so as to highlight the issues and reach a wider audience. Publishing op-eds based on EfD Kenya’s research in local dailies will also help to increase dissemination,” says Dr. Richard Mulwa, senior research fellow at EfD Kenya, University of Nairobi). “To get stakeholders views on future research, general basic research on the topic of interest should be conducted and then presented to them. This will help ground subsequent discussions,” says Mulwa. The event attracted different stakeholders with an interest in the water sector in Kenya. The organization and flow of presentations was commendable starting with a presentation on general overview on global water issues, followed by a presentation that targeted urban water pricing and subsidies, and finally a presentation on water access challenges in the rural areas. The best thing about the event was the level of engagement of the participants. It was a very interactive session. The discussants of each presentation were conversant with current water issues in the country, and were able to highlight aspects not mentioned in the presentations. The plenary discussions were also interesting with different participants giving their views on what the presentations highlighted and way forward. The results from the presentations helped shed light on water pricing and subsidies in urban Kenya and water access challenges and willingness to pay for water in rural Kenya. In addition, researchers from the EfD Kenya team were able to collect the views of the participants on the potential areas of future research in water related issues. The Water Policy Day was held at the Sarova Panafric Hotel Nairobi.